Continuation from the previous 117 parts, the whole series can be found at http://www.nikoport.com/columnstore/. and so let us start going through them 1 by 1, but before that let us setup 2 Virtual Machine with SQL Server 2017 RTM Enterprise & Standard Editions (and I will use Azure for that purpose), or you can install them both parallel on the same VM. Online index operations can only be performed in Enterprise edition of SQL Server. This is totally expected, since Online operations were always part of the enterprise edition, and having a particular index support operation ported to any other edition would be something beyond any surprise. Described already in Columnstore Indexes – part 92 (“Lobs”), the supported for the Large Object Binaries was missing for the Data Warehouse scenario since the very first version of the SQL Server with Columnstore Indexes (SQL Server 2012) until finally in SQL Server 2017 we have received this functionality. Though very much limited with the compression engine (LOBs over 8MB are getting less to progressively no compression), they allow to unlock a couple of key scenarios, such as where some design mistakes were made and it is too expensive at the moment to make such change. It might take a while for this code to finish, but it works fine on the Standard Edition of SQL Server 2017 as well as on the Express Edition of the SQL Server 2017 RTM. This is also quite expected functionality, since it makes absolutely no sense to limit Data Type usage on the particular version of the SQL Server. Especially since Service Pack 1 for SQL Server 2016, which democratised the usage of the programming surface for every edition, as explained in SQL Server 2016 SP1 – Programmability Surface for everyone! One of the very late addition to the SQL Server 2017 engine, the Clustered Columnstore Indexes started supporting non-persisted computed columns as described in Columnstore Indexes – part 108 (“Computed Columns”). On both Standard & Express Editions of SQL Server 2017 this script was executed successfully, leaving no doubts about the feature support. Like in the case of the of the Large object binaries (LOBs) for Clustered Columnstore Index, this is a programability feature which must be supported in all SQL Server editions in SQL Server 2017 and t works perfectly. One rather small (relatively other features, as I imagine), but an incredibly useful improvement was described in Columnstore Indexes – part 109 (“Trivial Plans in SQL Server 2017”) – is the ability to automatically produce Fully Optimised execution plans for the Database, which compatibility level is set to 140. You can see the fully optimised execution plan and the trivial execution plan on the left side of this text, both were taken from the SQL Server 2017 Express Edition. I am happy that this feature has got no Edition dependence, this is a needed improvement that simply increases the value of the offer and can actually be achieved in a lot of different ways, event without parallelism kicking in. While the Standard Edition of the SQL Server 2017 supports Machine Learning Services (In-Database), there is no such option for the Express Edition of the SQL Server 2017, because for that purpose you will need Express Edition with Advanced Services. While the execution plans differ (this execution plan has an Adaptive Query Joins on the Enterprise Edition), the memory grant size on the Enterprise edition on the original execution 76 MB, but after a couple of consecutive executions it will eventually lower to 7.3 MB, more than times improvement, because actually not much more than 2 MB of memory will be needed for the successful execution of this plan. On the Express Edition the situation is even simpler, there is not really much of memory to play with - the instance memory cap of 1GB would make the adjustment attempts look quite miserable and because standard edition does not support this feature, the lower (and actually free) edition does not support as well. Even though I would love to have Batch Mode Memory Grant Feedback on every single edition, I am fine with this feature being currently a part of the premium (aka Enterprise Edition) subset. The second Adaptive Query Processor improvement that was described in Columnstore Indexes – part 104 (“Batch Mode Adaptive Joins”), it is a feature that allows to choose the execution path of the particular execution plan dynamically, during its execution. In SQL Server 2017 we have support for the plans involving Columnstore Indexes only, but it was already announced that in the SQL Server vNext there will be an expansion for this functionality over to the Rowstore Indexes. In short, when we have a Columnstore Index Scan in Batch Mode and a potential choice between Inner Loop Join and a Hash Match, this choice will be done, based on specific cardinality estimations. You can see from the execution plans below, that the Standard Edition (and Express Edition as well) does not support Adaptive Query Joins currently. Unfortunately from my tests I have confirmed that Batch Mode Adaptive Joins are exclusive to the Enterprise Edition of the SQL Server 2017. Since this functionality falls under intelligent database, I understand why Microsoft decided currently to implement it only for the Enterprise Edition and I consider it to be a true enterprise solution. Regarding the Columnstore Object Pool memory cap, there is not much to add, besides that this number is great and for the total maximum size of the Buffer Pool of 128GB, I have not seen or heard anyone mentioning that the Columnstore Object Pool would be anywhere near the 32GB so far. This is a very generous cap and I hope that it will be taken advantage with better memory assignments for the Columnstore Indexes. I understand that someone building a Data Warehouse should consider going Enterprise Edition, but its price is absolutely out of question for the medium and small businesses. I expect Azure SQL Database to provide a very capable answer, but not everyone is ready/can/legally allowed to migrate their precious data to the cloud just yet. The MAXDOP = 2 of the Columnstore Indexes has been a pretty constant and no tests of mine has managed to take the SQL Server into exhibit more cores being available for processing. Originally described in 2015, Columnstore Indexes – part 59 (“Aggregate Pushdown”), Aggregate Pushdown is one incredible functionality that can potentially elevate the performance of the Columnstore Queries to the unbelievable level, executing simple aggregation operations on the Storage Engine level, not pushing millions of rows from the Columnstore Index Scan into the Hash Match aggregation iterator, but already delivering calculated result. Nothing has changed here from SQL Server 2016 and I honestly would love to see this functionality to be added at least to the Standard Edition, I do not expect this to change anytime soon or not so soon. Local aggregation is actually a very close "relative" to the Aggregate Pushdown, it is also enables to aggregate some of the data at the Storage Engine before pushing it all into the execution plans, and some of the partial aggregation (with GROUP BY, for example) shall be perfectly fitted for it. 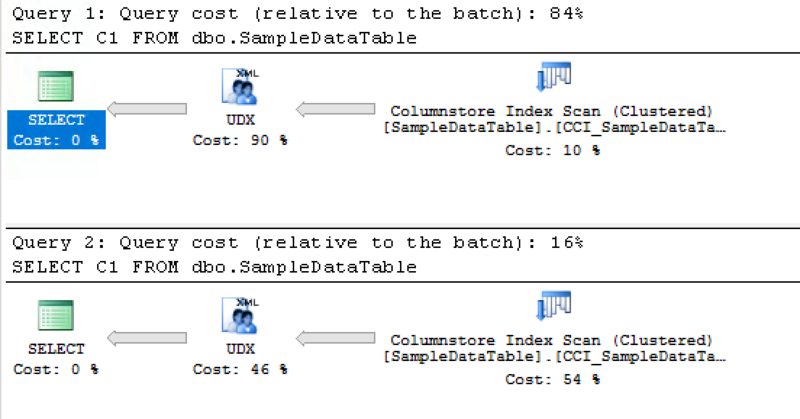 For more detailed description follow the Columnstore Indexes – part 80 (“Local Aggregation”). Let us execute a simple aggregation query against the FactOnlineSales table with a GROUP BY, which shall result in a partial local aggregation of the retrieved information. On the first image (Enterprise Edition) you can see that 230609 rows were locally aggregated and simply the result was passed to the Hash Match iterator, while the second image contains the total number of rows from the FactOnlineSales table being pushed into the Hash Match iterator (12627608 rows). A rather late implementation but an incredibly smart one that the String Predicate Pushdown is. Filtering the searched information through the usage of the dictionaries and elimination of the affected Row Groups is a very smart thing to do, no doubt! On the performance side the difference for the given set of data is more than 2 times, the Enterprise Edition is driving through the other editions. There will be an additional post dedicated to this topic. Below is a little setup script to create an indexed view on our FactOnlineSales table that is joined to the DimProduct, with a unique clustered Rowstore index and Nonclustered Columnstore Index over the columns DateKey & SumTotal. You will find the execution plan from the Standard Edition below - it just works. Yes, I know - Just Works is a harsh statement when considering the performance aspects of this implementation, but hey - there are scenarios when building it after the data modification is totally worth it! I have compiled a small table with the Columnstore functionalities, and the different SQL Server Editions (Enterprise, Standard, Express) where you can observe easily what is required for the feature to work (compatibility level) and the respective editions that do support or do not support it. This blog post will be updated occasionally in the nearest future. the query in SQL Standard runs in “row mode” only; SQL Enterprise (Developer) runs in “batch mode”. I am seeing similar results with other queries (using COUNT DISTINCT and aggregates) on small data sets, where we experience an 86% improvement in speeds just running batch vs row mode.